D.S. 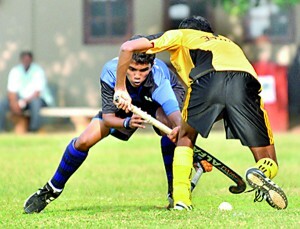 Senanayake College downed S. Thomas’ College by three goals to one, in their Under 19 Colombo South Schools hockey fixture, played at Mount Lavinia on Thursday. At half time both schools had scored a goal each. In the third minute of play, D.S. Senanayake were awarded a penalty corner, which was converted by Thilini Maneesha and in the 16th minute, S. Thomas’ equalized when R. Nallaperuma converted a penalty. After the turnaround, D.S. Senanayake took the lead once again when right inside, A. Rahuman, passed to left inside, Imad Cutilan, to add the second in the 25th minute and in the 36th minute, Kusal Jayaratne, the centre half worked his way through the Thomian defense for Imad Cutilan to add the third goal for D.S.S. Action at the St. Thomas’-D.S. Senayake Under 19 hockey fixture. Photo by Amila Gamage. The Thomian Old Boys posted a 3-2 win over the school’s present boys, in their annual hockey fixture at Mount Lavinia on Thursday. For the Old Boys, the goals were scored by their centre forward off a pass from right extreme Pujitha Walpitagamage, the next goal was by Pasan Wijeratne off a penalty corner, with the third also being scored by Pujitha. For the present boys, the scorers were centre forward Lashan Karunakaran and right extreme Damith Kandara.